This year marks the debut of Ye Scallywag!, a day-long music, craft beer, wine and food festival, to take place on Saturday, October 22 at Waterfront Park in San Diego, CA. Produced by premier music festival production company Synergy Global Entertainment (SGE), Orange County, California's most successful and respected craft beer festival producer Brew Ha Ha Productions, San Diego's leading alternative radio station 91X, and California's top rock radio station KFM-BFM, the festival will feature over 100 craft breweries and artisan wineries, along with a full day of music led by NOFX and Bad Religion. Fat Mike of musical headliner NOFX says, "When I started NOFX in 1983 I dreamed of being a scallywag one day, at least by the time I was 50. 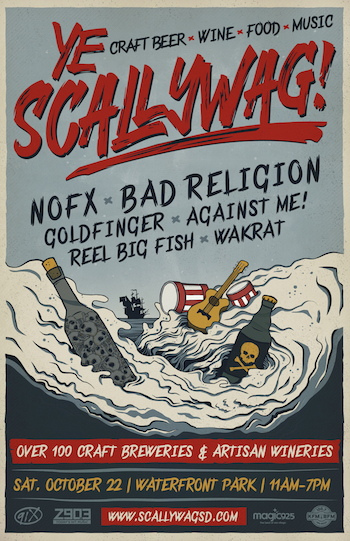 Well, not only am I a scallywag, but I'm also playing the Scallywag festival! P.S. What's a scallywag? Is that like being a pirate?" During early entry tastings (from 11:00 AM-4:00 PM), and general admission tastings (from 12:00 PM-4:00 PM), Ye Scallywag! 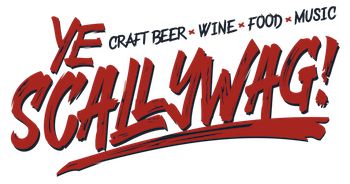 attendees will enjoy complimentary craft beer and wine samples from top California breweries and wineries at Ye Scallywag!. Local artisan food trucks and pop-up restaurants will also be on site selling a variety of delicious and unique food options throughout the day and evening. After 4:00 PM, several Ye Scallywag! brewers and wineries will offer drinks for purchase, with music continuing until 7:00 PM. Live music will be on the BMW of Escondido Main Stage, with performances by NOFX, Bad Religion, Goldfinger, Against Me!, Reel Big Fish, and Wakrat. Music kicks off right around 12:00 PM. The initial list of breweries includes: Burning Beard Brewing (San Diego, CA), Bottle Logic Brewing (Anaheim, CA), Clown Shoes (Ipswich, MA), Fall Brewing (San Diego, CA), Mikkeller SD (San Diego, CA), and Modern Times (San Diego, CA). The initial list of wineries includes: Rebel Coast (Paso Robles, CA), William Hill (Napa Valley, CA), Maggio (Lodi, CA) Old Soul (Lodi, CA), Chronic Cellars (Paso Robles, CA), and Dry Creek (Sonoma, CA). Pre-sale tickets for Ye Scallywag! will be available tomorrow, Tuesday, August 30 through Thursday, September 1. Information and pre-sale codes from our participating radio stations are available at: 91X, 100.7 KFM-BFM, Z90, and Magic 92.5. General tickets go on sale on Friday, September 2 at 10:00 AM PT. Please note that the event is for those 21 and up. General Admission and VIP tickets will be available for purchase for the following prices. Note: All tickets include beer and wine tasting, and access to the BMW of Escondido Main Stage for live music. Ye Scallywag! will have a convenient drop off area for ride sharing and taxis on site. Additionally, the Green Line to the Santa Fe Depot, San Diego's Santa Fe Depot train station, is just three blocks from Waterfront Park. 91X (XTRA-FM 91.1) and 100.7 KFM-BFM (KFMB-FM) are members of SDLocal, a joint operating arrangement between Local Media San Diego, LLC (a San Diego-based broadcasting company backed by private equity firm, Thoma Bravo, LLC ) and Midwest Television, Inc. LMSD also operates Z90.3 (XHTZ-FM) and Magic 92.5 (XHRM-FM), Midwest Television, Inc. also owns AM 760 (KFMB-AM) and KFMB TV-8.